Three times serve East Frisians right. Without any doubt – East Frisians and tea belong together. Average tea consumption per year is seven (!) pounds in East Frisia, only the Irish drink more. 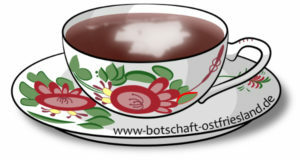 Every East Frisian drinks about 300,000 cups of tea in their life. No wonder: There are three cups per break and four breaks per day: one early in the morning, one before noon (the so called “Elfürtje”), one in the afternoon and one in the evening before going to bed. The Dutch were the first people bringing tea to Europe, eventually introducing it to East Frisians at the beginning of the 18th century. Rumours have it that the authorities ordered East Frisians to drink tea because they disapproved of their enormous consumption of beer. It seems more likely though that people back then decocted their drinking water for hygienic reasons and added tea leaves to improve the flavour. Wouldn’t you know it: Just after they got used to it (in May 1777, to be precise), Frederick the Great, King of Prussia, prohibited tea drinking in East Frisia by law. The official version was that tea was a “Chinese dragon poison”, but behind the scenes breweries are believed to have had a finger in the pie. Less than two years later, though, the East Frisian bull-headedness took the victory and the silly law was off the stove forever. Tea drinkig got deeply embedded into East Frisian culture – so deeply, in fact, that in the times of WW II, the East Frisians got extra rations of tea – as the only people in Germany. …hält stets ein Tässchen Tee bereit. – snugness and Frisia go together, a cup of tea in any weather” (old German proverb). But taste depends on the preparation! Apart from the right type of water – it has to be soft – most notably the right composition of tea is critical. Only the tea companies in East Frisia provide the right mixture of teas – finest Assam teas together with Darjeeling- and Ceylon teas. 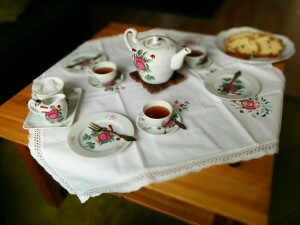 The “tea tasters” are eminently respectable people in East Frisia! Put the tea leaves in a warmed teapot, one teaspoon for every cup and one extra spoon “for the pot”. Now pour boiling water on the leaves until they are just about covered. Steep it for three minutes and it will be stimulating, steep it for five minutes and it will be calming. Now fill the pot with water. 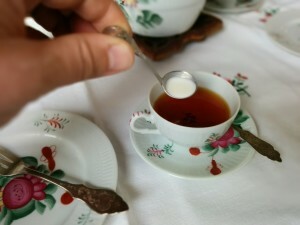 First put a “Kluntje” (a great crystal of sugar) in every cup, it will crackle when you fill the cup with tea. And to finish, pour in some cream that will conjure a little cloud (“Wulkje”) into the cup. The dude who stirs the tea in his cup not only reveals poor upbringing, but will never get the right feeling of drinking a Frisian cup of tea: First you get the creamy and cool layer of cream, followed by acerb flavour of tea, crowned by the sweetness at the end.